Thinsulate insulated Hawaiian Kup Kollars on 16 oz ice tea glasses. You can prepare this dessert from Boulder Ice Cream in a short time but your guests will think you slaved for hours! 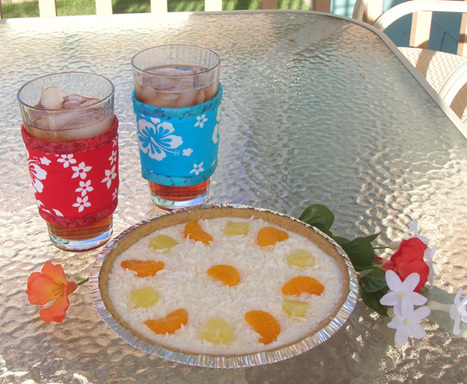 Serve with frosty drinks using colorful Hawaiian cup sleeves on the glasses. 1. Slightly soften a pint of Boulder Ice Cream Coconut flavor. 2. Spoon it into a graham-cracker pie crust and freeze. 3. Just before serving, sprinkle grated coconut on the pie and decorate with cut pieces of fruits such as pineapple, mango, kiwi, and oranges. July is National Ice cream Month. We suggest you use a Kream Kollar and begin taste testing your favorite flavors this month!